This is the season to use pumpkin in our recipes. No, I am not tired of pumpkin after October. For a squash lover, I think pumpkin is a sure-sell. Of course, you can use real pumpkin but I was out to save time. I find that most recipes using canned pumpkin are fast and easy. This one is delicious too. Potatoes have always been a comfort food, in my family. When, I was a child and did not feel well, my mother would make me mashed potatoes. They were like a bit of sunshine casting its rays over me. As an adult, when I see a potato recipe, chances are, I am going to make it. 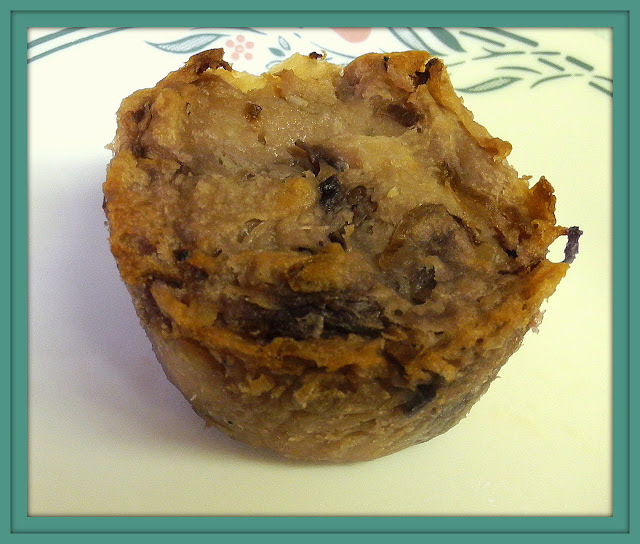 When Paula Deen shared this recipe, it went with me, into the kitchen and turned into these Golden Potato Cakes. They come with the sunshine built inside. They definitely make me feel better. The title of this recipe is what got my attention. Having made and liked gazpacho, putting it into a pasta dish, made sense and was appealing. Gazpacho Pasta - Rachel Ray (some modifications made) Serves 4 See the video here. This month, Chinese Food is the theme for our recipes for Kosher Connection. This is not authentic fried rice but I think it still fits the category. 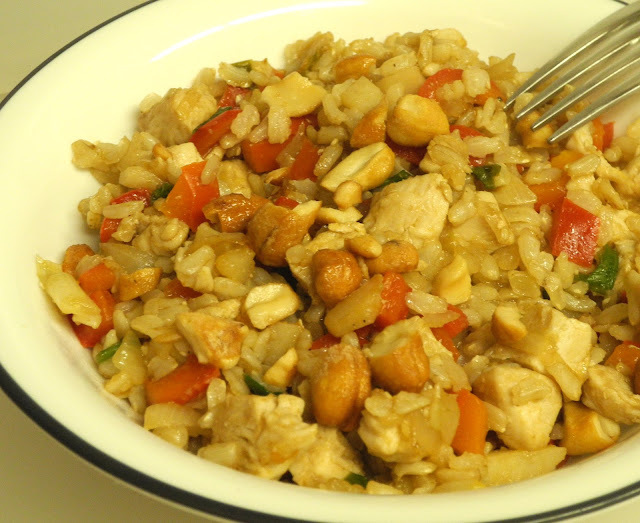 This is Ellie Krieger's Spicy Fried Rice with Peanuts and it is good, even better than my more traditional recipes for the rice. For those of you who do not know how much respect, I have for Ellie's dishes, let me say right now, I have found her food to be healthy and tasty and hubby loves anything I make from her books. He does not know they are Ellie recipes but when I make one, he always comments on how good it is. I have made this recipe a number of times with minor changes, each time, such as leaving out chicken, this time. I already had a chicken dish made and saw no reason to add it to the rice. This was part of a Chanukah meal. I have this posted on My Sweet and Savory with Cashews in place of the peanuts. Since, I make salmon almost weekly, I like to experiment. This week, I made a simple dish, pouring Sweet Vidalia Onion Dressing over the salmon fillets and sprinkling crumbs made from sweet potato chips plus some oregano from the garden. Different and good. Pour some water on the bottom of a baking dish or spray with cooking oil. 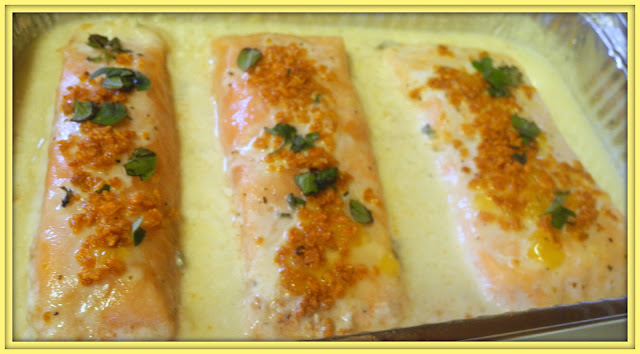 Place salmon fillets in pan and pour dressing over the salmon. I did not cover them but drizzed over about 2/3 of the fillets. Soup was so good for us, last night, that I dared making it, for a second night in a row. Usually, I would not do this. Soup is filling but hubby gets hungry after a while and I can't say I blame him. Last night's Avocado-Spinach soup can be found here. I have had a craving for potato soup for days. The truth is, I almost always have a craving for something-potato and I restrain myself. Tonight, I played it differently. Actually, this morning, I put the soup up in a crockpot. I made it very plain until I got home and tasted it and then I quickly made some additions. It turned out to be a great soup, not just a good one. New York Cheesecake - I made the recipe from Jenn's Random Scraps. I made it without a crust and cut the recipe in half to make it like a pie. Check out Jenn for a luscious cake. Also, get the recipe there. It is interesting and even hard to understand why some classes love when I bake for them, others are very happy, and then there are some who are lukewarm. I am happy to share that this year's group enjoys and praises what I bring in. It makes me truly happy if they like the goodies. I don't think I have to worry about rejection with this class. Today, I brought them cupcakes and chocolate cookies. They could not get enough and their faces lit up as I left a little something on their desks. I came home on a high. This dinner brings a smile to my face. Now that I have overcome a dislike for eggplant, I thoroughly enjoy it. It is one of my favorites which speaks volumes for where it stands on the long list of likes. It is way up there. This year, I have decided to serve manicotti and stuffed shells, at the Chanukah party. Actually, I decided to make the shells but I saw a box of manicotti and wanted to play with it, too. I made one tray gluten-free for hubby, one tray regular stuffed shells and one of manicotti. 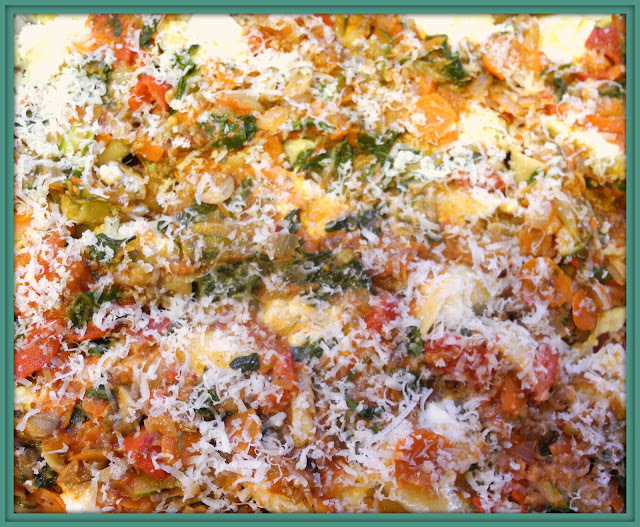 I used a spinach cheese mixture for one tray of manicotti and one tray of shells. 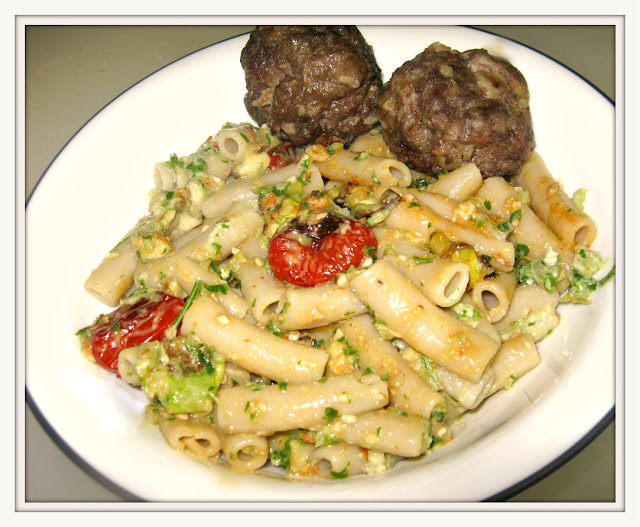 I made this vegetable -pasta dish as the second shell dish. This is the new recipe for me and it is intriguing. I added the mushrooms because I could, as my husband would say. I also used diced tomatoes which was not in the original recipe. I have to plan the rest of the menu. I am thinking garlic bread and spinach salad with a simple dessert. Sorbet and cookies sounds good to me. I started baking for our annual Chanukah party and my first thought is the children. What do kids like? Chocolate chip cookies, brownies, cupcakes, sprinkles and frosting. The best place for cupcakes is Martha Stewart's book, appropriately called Martha Stewart Cupcakes. Over the recent years, I have made a number of recipes from the book and each has been gobbled by the children and adults, alike. 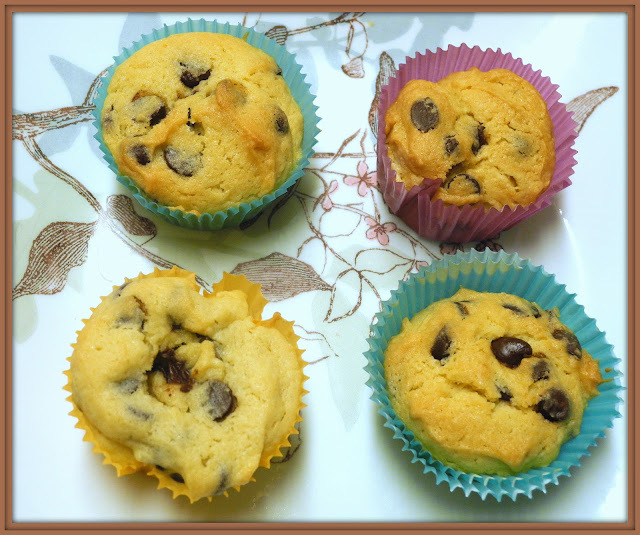 This time, I chose the chocolate chip cupcakes and I froze them without the frosting. Actually, they appeal to me plain but for the kids, I will add some frosting, before the party. It is Chanukah and it is traditional to eat fried foods. The custom of eating fried foods is in remembrance of the miracle of Chanukah, which is centered around oil (one cruse lasting for eight days). 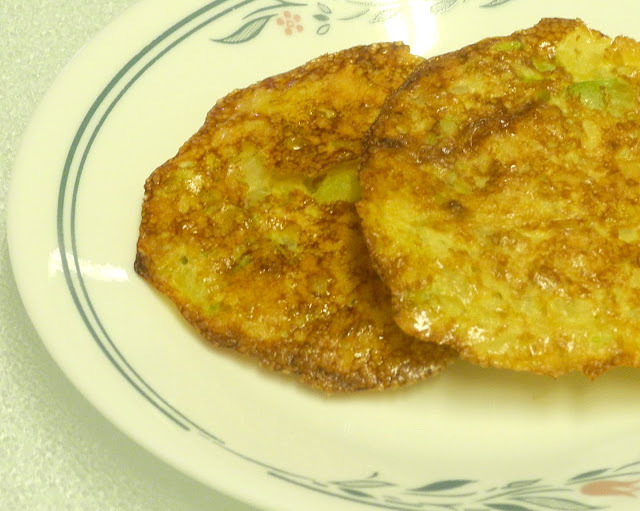 Latkes (fried potato pancakes) are traditional, topped with applesauce or sour cream, but there are all kinds of vegetable pancakes that are also delicious. Jelly doughnuts are also popular during this holiday. I decided to go the healthy route and followed Ellie Krieger's baked latke recipe and also made three of them in a skillet. We had the best of both worlds, mostly baked with a naughty bite of fried pancakes. I like the idea of including zucchini. I have made potato latkes with carrots in the past, also. 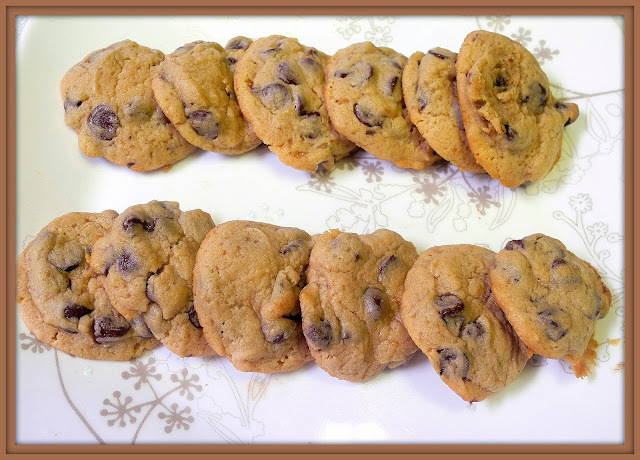 I did alter the amounts used in the recipe and since we finished them up, I did a good job. On the other hand, hubby tends to finish whatever is there. Skinny men can get away with it. I have to admit, I took a lot of liberties with this recipe because I had to make it gluten-free and because, I had spinach, not arugula, in the house. Despite these changes, my inspiration was Ellie's French Bread Pizza. I had saved a ball of pizza dough from the last time, I made pizza, and used that instead of the French Bread. It would have been easier using bread. 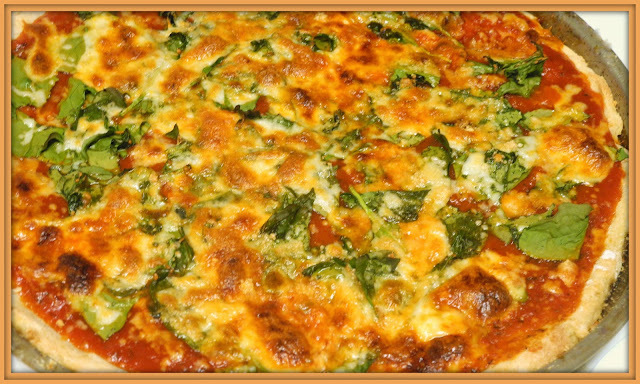 After rolling out the dough and baking it at 400 degrees for 20 minutes, I poured marinara sauce on top of the surface and covered it with about 2 cups spinach and then with a little more than a cup of shredded mozzarella and 1/2 cup Parmesan. I baked it for another 10 minutes or until the cheese turned golden. Then, we demolished it. Thanks to Ellie for the inspiration. 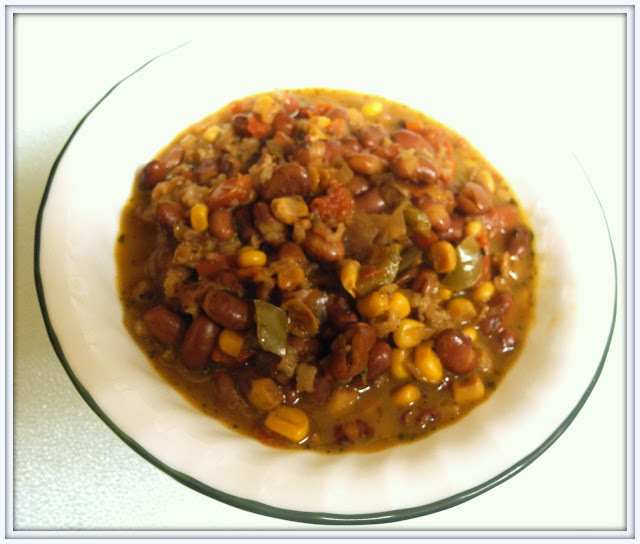 As I discussed, in the previous post, I am cooking from Ellie Krieger's, Comfort Food Fix, this week. I had this book, marked up, already with recipes, I want to make. The strangest part of my selection is that those are not the recipes, I am planning to use. I ended up, picking a whole set of new recipes. This proves how appealing Ellie's recipes are to me. I think, I would be happy with almost any of them. This week, I am going to be cooking from Ellie's Krieger's "Comfort Food Fix". I have made several recipes from the book, in the past and I plan to make additional ones, this week. 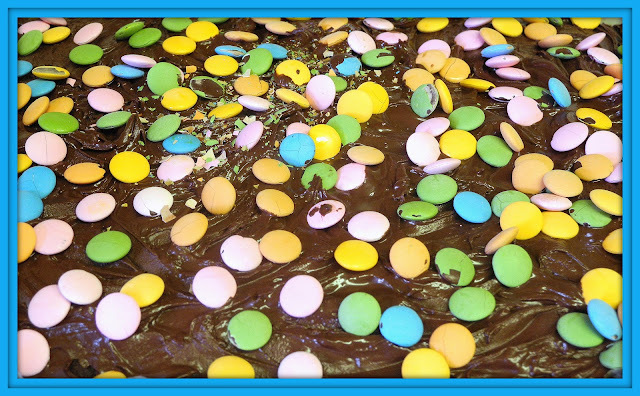 I am including some photos from Ellie's recipes. For a number of years, we had a wonderful group who cooked Ellie Krieger recipes, weekly. We have kept the linky active but as a group, we have not formalized any recipes for the group to make. We would like to re-create this group. CEiMB, Craving Ellie with My Belly is found here. Margaret of Tea and Scones is our cheerful and competent leader. We discussed a good way to bring back CEiMB is to select a theme and what is more appropriate for December than cookies. There are several recipes online as well as in Ellie's books. I found a package of Bean Cuisine Soup Mix, behind some cans, on a shelf in my storage cabinet. Since they do not make this anymore, I have had it for a few years. Since it was dried beans and seasoning, I figured it was all right to use. I am, in the habit, of throwing out anything that has been around for a while while hubby moans and groans. I am afraid to take chances with our health. This did not appear to pose a threat so I bravely carried on. I decided not to make soup but a bean dish. In a large stock pot, saute vegetables & garlic in olive oil. Add water, wine, vegetable broth, beans, spice packet contents, tomatoes, corn and chicken. We had an early Chanukah party today even though Chanukah does not start yet. I baked my class chocolate cake and I received the best compliment, a teacher can get. One of my boys said that now there are two best bakers, his Mom and his teacher. I was glowing the rest of the day. Some classes respond to my baking with enthusiasm and gratitude and other classes eat it all up without a comment. It seems to be a class trait. Of course there are some who thank me three times and tell me how delicious the goodies are but more just eat up and should not be proud of their behavior. This year, I am blessed with a class of wide smiles and lots of thank you's. This is supposed to be a layer cake and if you click on Taste of Home below, you will get the original recipe. I did not use their icing either. I have a deal with my class and have had the same challenge for them, for years. Each week, if they return their work folders to me, signed by a parent, I bake them cookies. I usually allow one or two to forget. This year's class has not tasted a cookie yet, this year. As a group, they could not pull this off. They are an enigma to me. As much as they want the extras, they won't put themselves into it. I have never met this before and it is challenging me. Fortunately, I like a good challenge. I am open to suggestions. Discipline is not the problem. If I lower my voice so it is barely audible, the class is quiet. They do what they have to do but if I give them an inch, like taking a breath, they are rarin' to go. If I would allow them to continue, I don't think they would ever stop. No, I am not exaggerating. Come and join me in spinach heaven, a place where spinach is king. 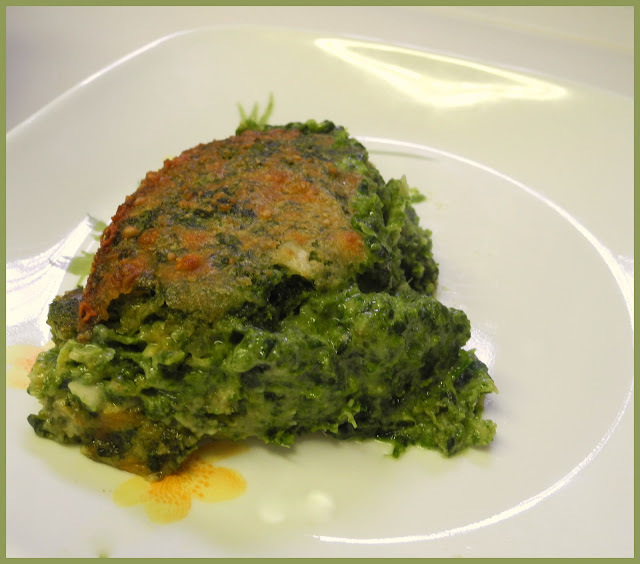 I have made a number of recipes with spinach, the past week as well as this one. I, particularly like this recipe but I frown at what it was called at Allrecipes. The title was Spinach Brownies and these are nothing like brownies, even savory ones. This makes a good casserole or kugel. It is creamy and has a lovely spinach taste, altered by the cheese. 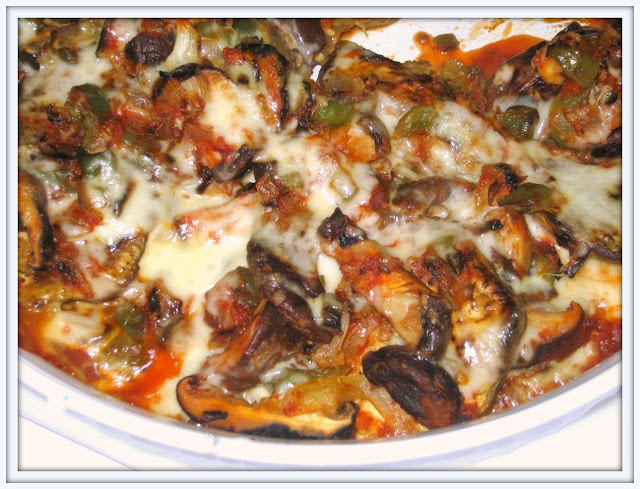 Preheat oven to 375 degrees F . Lightly grease a round or square casserole. Place spinach in a medium saucepan with enough water to cover. Bring to a boil. Lower heat to simmer and cook until spinach is limp, about 3 minutes. Remove from heat and set aside. It feels good, being back to weekly planning. In the summer, it does not work, for me but when I am teaching, it makes life a lot easier. Last week was comfortable, knowing what I was doing and when I was doing it. I had none of those deer in the headlight looks when I had no clue, what to make for dinner, which was an hour away. This week, I am cooking from Martha Stewart's Living cookbook. It is not easy to select recipes from a book with such variety and multitude of recipes. I ended up, using code words. Wednesday is soup night so I checked out Martha's soups. Tuesday, I cook for Wednesdays with Donna Hay so I chose a Martha salmon. I am beginning to live on my leftovers. Since we lost our electricity (and got it back), I have been careful about freezing food in quantity. I usually have a floor freezer filled with goodies as well as my refrigerator freezer. I have not even turned on my big freezer.